It's a good start to the weeks's free fiction with some great new text fiction, flash fiction, and audio fiction. Today marks the conclusion of Theodore Savage (art to the left) at HiLobrow, E-books and more to come. • At Daily Science Fiction: "Recognition" by Bill Glover. Superhero. "So here I sit, staring at a small portion of baked chicken with a side of carrots and potatoes in some sort of vinegary sauce. I have been coming to these things for ten years, and they always serve chicken, and always there is some odd flavored but nonetheless bland sauce on the vegetables." 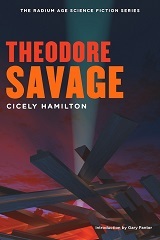 • At HiLobrow: "Theodore Savage - Part 25 conclusion" by Cicely Hamilton. Science Fiction. "When war breaks out in Europe — war which aims successfully to displace entire populations — British civilization collapses utterly and overnight. The ironically named Theodore Savage, an educated and dissatisfied idler, must learn to survive by his wits in the new England, where 20th-century science, technology, and culture are regarded with superstitious awe and terror." Includes links to all 25 chapters. • At L5R: "Shadow of Disgrace" by Shawn Carman. Fantasy. "The Asahina family daimyo walked swiftly, his expression greatly troubled. A pair of advisers hurried in his wake, struggling to keep up. 'I am not yet convinced that this is at all an advisable thing to do,' he said, his voice tense and tight. 'We are as yet a very young family. My parents only recently retired. What we are undertaking here… this could be construed as disrespectful or even heretical.'" At Every Day Fiction: "Aurora’s Sky" by Kenton K. Yee. Animal Fable. At Planet Magazine: "Five Haiku" by Denny E. Marshall. At Quantum Muse: "Family" by Michele Dutcher. At 365 Tomorrows: "Copy and Paste" by Bob Newbell. At Toasted Cake: "Shadow Falls, Echo Fades" by Jeff Stehman. Audio. • At Author's Site: "Bones are White #7 - Eusocial Networking, Part 1" by Scott Sigler. Horror. "Welcome to a new novella. This time out, EUSOCIAL NETWORKING, a story set in the 7th SON universe of J.C. Hutchins. If you like bugs you'll love this (and if you hate them, it will scare your undergarments right off). " • At Chilling Tales for Dark Knights: "The Wendigo" by Algernon Blackwood. Horror. "A considerable number of hunting parties were out that year without finding so much as a fresh trail; for the moose were uncommonly shy, and the various Nimrods returned to the bosoms of their respective families with the best excuses the facts of their imaginations could suggest. Dr. Cathcart, among others, came back without a trophy; but he brought instead the memory of an experience which he declares was worth all the bull moose that had ever been shot. But then Cathcart, of Aberdeen, was interested in other things besides moose—amongst them the vagaries of the human mind." • At Fantastic Worlds of Edgar Rice Burroughs: "Episode 5 - Out of Time's Abyss"
"Bradley has almost escaped from the Wieroos. Having killed Fosh-bal-soj, his captor, he has crept through the city of Oo-oh. He finds a captive Galu girl. His conversation with her is interrupted by the advent of several Wieroos"
• At SFFaudio: "The Dreams In The Witch House" by H.P. Lovecraft. Horror. "Whether the dreams brought on the fever or the fever brought on the dreams Walter Gilman did not know. Behind everything crouched the brooding, festering horror of the ancient town, and of the mouldy, unhallowed garret gable where he wrote and studied and wrestled with flgures and formulae when he was not tossing on the meagre iron bed. His ears were growing sensitive to a preternatural and intolerable degree, and he had long ago stopped the cheap mantel clock whose ticking had come to seem like a thunder of artillery. " • Audio at Crime City Central: "Times Past" by Matthew C Funk. • Audio at Internet Archive [LibriVox]: "The Aesop for Children" Fables.